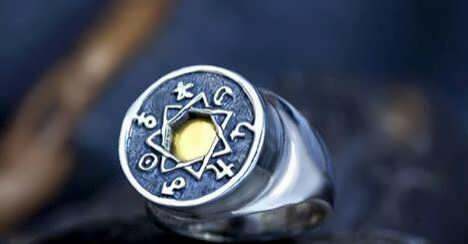 The Chaldean order ring contains the symbols of the 7 stars arranged in the Chaldean order in the inner circle and the signs of the wheel of the zodiac in the outer circle. The middle part of the ring contains seven metals, iron, lead, pure gold, silver, copper, and brass (replaces the metal, mercury). The power of the ring is in the combination of the seven metals, in which each are connected and strengthen different qualities of the person in accordance with the star to which that particular medal is connected. The new Chaldean Astrology ring Enjoy!